Safe handling of any wildlife carcass is important to avoid exposure to wildlife pathogens (infectious agents that cause disease, including bacteria, viruses, parasites, and prions). Over the last 20 years, 73% of new pathogens found in humans can also infect at least one species of wildlife. It is important to reduce contact with potentially infectious tissues and fluids to prevent the transmission of disease from wildlife to humans. Do not shoot, handle, or consume any animal that is unusually thin or appears to be sick. Wear latex or rubber gloves when field-dressing. Only consume meat that has been boned-out. Do not saw through bone and avoid cutting through the brain or spinal cord (backbone). Minimize handling of brain and spinal tissues and associated fluids. Wash hands and instruments thoroughly after field-dressing. Avoid consuming brain, spinal cord, eyes, spleen, tonsils, and lymph nodes of deer. Normal field-dressing, coupled with boning out a carcass, will remove most of these body parts. If a deer is commercially processed, request that your deer is processed individually, without the additional of meat from other deer. Tuberculosis and brucellosis have never been diagnosed in Virginia wild white-tailed deer but tularemia, Salmonella, and Q fever are widespread across all of North America and can lead to serious health problems. 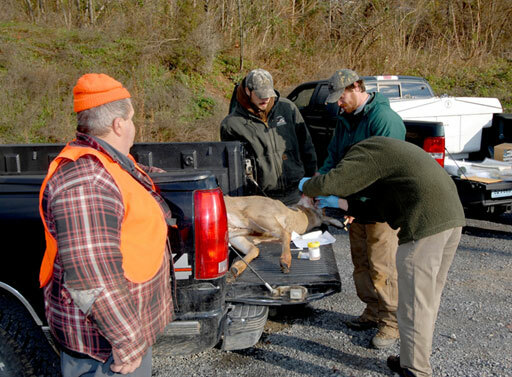 How can you avoid pathogen exposure while handling a deer carcass? Wear gloves! Gloves will not only protect against viruses, bacteria, and parasites, but also against ticks, which carry their own host of pathogens. Disposable or rubber gloves (wash them well!) provide a physical barrier between a deer and a hunter. Gloves are the best way to avoid disease transmission. Shoulder or elbow length gloves are best. If you begin to feel ill within a few days or weeks of exposure to dead wildlife, contact your doctor! Remember to tell them that you have been handling a dead animal, even if it looked healthy and even if you were wearing gloves. Early symptoms of many pathogens transmitted by wildlife can resemble other diseases, such as the flu, so you need to let your doctor know what you have been up to!